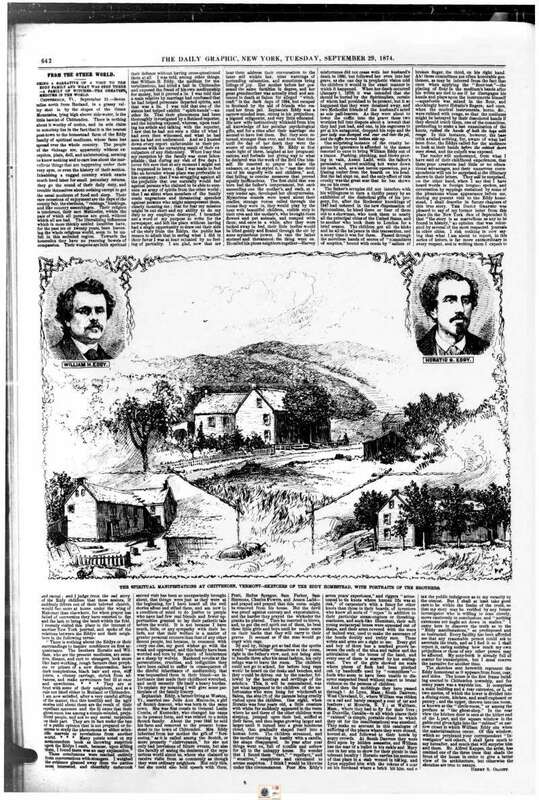 In Late 1874 The New York Daily Graphic sent Col Henry Steele Olcott to examine the claims of the Eddy Brothers at their home in Chittenden Vermont. The result became a book which can be downloaded quite easily. However, much more interesting is the original piece in the Daily Graphic. After much searching and, for a few missing pages, the wonderful help of the USA's fantastic Library of Congress I have assembled all 33 pages as separate pdf's . I am now looking at finding a way to link them into one document I can post somewhere to enable people to downloaded. The book covers it but lost are the wonderful illustrations. There's too much for me to read and I'm not a historian anyway but I skimmed the aspects covered. What a different time that was when 'the spooks' were modern and fashionable and covered in depth in an ordinary newspaper. A world so very different from the one in which we're now living. As a side issue I found the adverts fascinating. Yes I love the adverts too Mac. The illustrations are magic, Col Henry Steele Olcott is a fascinating character. He was one of the first, 1855 as a young man under the pseudonym Amherst, to write about the excesses in terms of would be trance communicators (the millions of Tom Paine's, George Washington's & Benjamin Franklin's) and also in the would be phenomena. Worth a read because what was once true seems very true even today with the excesses of the would be Channellers and purported Physical Mediums. Its a transcript of Olcott as Amherst. That was an amazingly wordy piece but what interesting times they must have been for anyone interested in the then-new phenomenon of modern mediumship. "Plus ça change, plus c’est la même chose." "Plus ça change, plus c’est la même chose." Absolutely mac wordy but so apt to the time especially the last few years with the Mayan Calendar. Were the Eddie brother´s genuine? As i know, Olcott has been convinced, that the Eddie brother´s were genuine. In wikipedia one can read, that they had been debunked. Does anyone knows sth. about that? I don't know what the true situation is but it's wise to be cautious about what's written in Wikipedia's open pages. Seek alternative sources of information to what's written there about matters spiritual rather than accepting a single source is my suggestion. Pls. don´t get me wrong. I´m not a fundamental sceptic. But i´m truly disappointed about what people "sell" as mediumship or physical mediumship today. Could be, that the one or other of these cheaters read this book, too. I think, it´s not easy, to spread real lies in wikipedia. So as a first data source, it´s not so bad imo. There's nothing to say Olcott was wrong, one must also consider the controls in place and the nature of the evidence provided. Being caught in deception doesn't mean that was the case everytime, though it's certainly not a good sign. You are in good company when you say that you're disappointed with modern-day mediumship. (of whatever sort) There's an old saying that things ain't what they used to be and this certainly could apply to mediumship. There are many sources of information and Wikipedia is just one - OK as a starting point but proper research is recommended if one wishes to understand more. I intend to look at the Eddy boys, I have a fair amount of info gathered. As you know I am a cautious researcher. My feeling is the Eddy brothers were quite possibly either fraudulent or "mixed" (real and fraud). They fit in with my study of the dubious Fay's, a mixed bunch where the first person to appear after a dark séance with his coat the wrong way round, the Davenport Fay, was caught numerous times. Then there is the Fay who married Anna Eva Fay, caught so many times in fraud That he changed his act to one debunking Spiritualism. Its no wonder where Anna Eva learned her tricks (https://www.spiritualismlink.com/t1263-anna-eva-fay?highlight=anna). Oh well more research to do on the Fay's and then the Eddy's. The number of so called heroes of survival who get chopped down is concerning. However, progressively there are some who it is very hard to fault even though sometimes their behaviour may not be admirable ( that's because I jusr ran into one of my white Crows, Leonora Piper, having an unsubstantiated attack on a fellow medium for fraud with no proof except a Spirit told her, the medium in question was a competitor involved with Myers, an amateur with an impeccably well tested record). In the end though it is the messages I have received and that Lis and I have given which underpin my proof no matter how few survive research. I forgot to say that, of course Olcott & Blavatsky, the founding force of Theosophy were Eddy supporters and went on to defend the Holme's in the cheating scandal over Katie King's séance appearance in 1876 (which damaged Robert Dale Owen's credibility). Not that Blavatsky's record, attacked as a fraud by DD Home & discredited by members of the SPR in research is much to hang onto. The one thing that I do realise is that Olcott never told the Daily Graphic readers that he was a committed Spiritualist. Nice to be back, now I am on my new PC !!. I hope my contributions here can help with the debate on the Eddys ( by the way, I DO have doubts about the Fays !! ). Firstly, congratulations admin on this work. Olcott was indeed persistent when it came to investigating the Eddys. They were not the easiest of people to deal with. Let us not forget that Olcott was also legally trained, he was no fool. I am fortunate to be sat here with an original copy of 'People from the other World' by Olcott, which is the account of his investigations at Chittenden. Being in the UK puts me at a distinct disadvantage in that I am not easily able to wander around New York state, or Vermont, which I would love to do in the steps of the pioneers!!. Anyone in Vermont, or Chittenden can STILL locate the site of the Eddy farm. It is now the 'High life Ski Club Lodge'. The Eddys are buried nearby, Horatio in nearby Pitsford Cemetery. Now, a story, make of it what you will. Quite a number of years ago I spent some considerable time investigating the Eddys story, and put together a presentation for a Spiritualist Group. That night I was to attend a physical seance, the medium was David Thompson who was demonstrating to the group. I was happily minding my own business during the seance listening to what was going on ( I tend to look around a lot, yes, not much use in the dark, but it helps me pinpoint any sounds or activity and in particular direct voice ) when a faint voice called my name. This became stronger and then said 'sit still, I want to speak to you'. Realising this was an American accent I was intrigued. What transpired was a communication from Horatio Eddy who came to thank me for my efforts in telling the story of his family's mediumship. a friend we were with. He recounted our previous meeting and gave his greetings. Such is physical mediumship. Again the medium was bound and gagged at this time. I have a recording ( and I know there must be more ) of the first communication. I keep thinking that I am maybe the only living person on this earth who has actually SPOKEN to one of the Eddy brothers !!!. Now that's proper physical mediumship! Thanks Leroy wonderful story, was that back in the Haymist days with Paul Barker as circle leader? The days prior to the arrival of Louis Armstrong I believe? It was great evidence given the research you had been doing. I agree about the Eddy's, unfortunately their personal behaviour did make them seem suspect. I have a copy of Olcotts book, which carries a lot more detail, but love the Daily Graphic for the illustrations. Like you I would love to be able to wander around those areas, as well as visit the other key historical sites. Sorry if the reply is a little late, I have been so damn busy of late !!. I think if my memory serves me it was just after the Haymist days. I often think back to that seance. I have had some great experiences I know, but if you were to talk to me now I have got increasingly cynical about the whole business. It sometimes feels like my 40 years of investigation have all been for nothing!! I just wish it was Haymist days, I have so much respect for Paul Barkers leadership of that circle. who was circle leader then Bianca? Yes, I met Bianca, so I think it probably was.